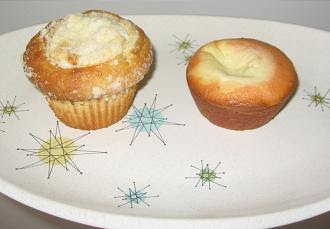 Cooking at Café D: Test Kitchen Challenge - "Strawberry Cheesecake Cupcake"
The bakery's cupcake is on the left - mine's on the right - you can prolly tell that. Why is my cupcake pink? Well, they were sold out of the "Strawberry Cheesecake cupcake" I usually buy, so I bought a plain one. But, the strawberry one is the cake I strove to recreate. This challenge took two days and four test batches...lots of notes. Second batch - Cream cheese filling cooked through. Yes! But, there was a different issue. No! 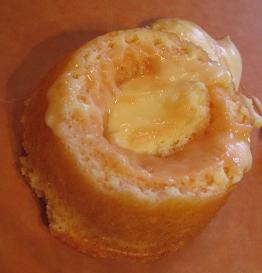 The filling sank to the bottom of the cupcake. Grr. So, the density of the filling was higher than that of the cake. You know, I would have paid more attention in science class if they included classes on cupcakes! Plan for next batch? Well, I can mess with the filling's recipe or try to increase the firmness of the cake. Third batch - I cooked the cakes for 5 minutes before piping the filling into each cup. Improvement. But, filling still sunk. Geesh. There's a delicate balance here - getting the filling to remain on the top/middle and still cook through. Fourth batch - Cooked the cakes for 10 minutes, piped filling in leaving a good amount on top. (In previous batches the pink had almost completely surrounded the filling. But, I decided that part of the reason the filling wasn't cooking well was due to the moisture not having a chance to escape. It was volcano-ing out during cooking and creating a blow-hole. I figured, I could just create an escape hatch right off the bat.) I also extended the cooking time until the cream cheese filling turned a light brown on top. Then pulled them out of the oven, and again, left them in the pan, allowing them to continue cooking. Aha! I think we have a winner! My cupcakes are still slightly smaller, so for the plan for the next batch? I will fill the cup about 3/4 full with cake. (And, I want to try chocolate cake with cream cheese filliing.) Other than that, I think it's a pretty good recreation of the bakery original. And, it's cheaper... and I have full control over what goes inside.